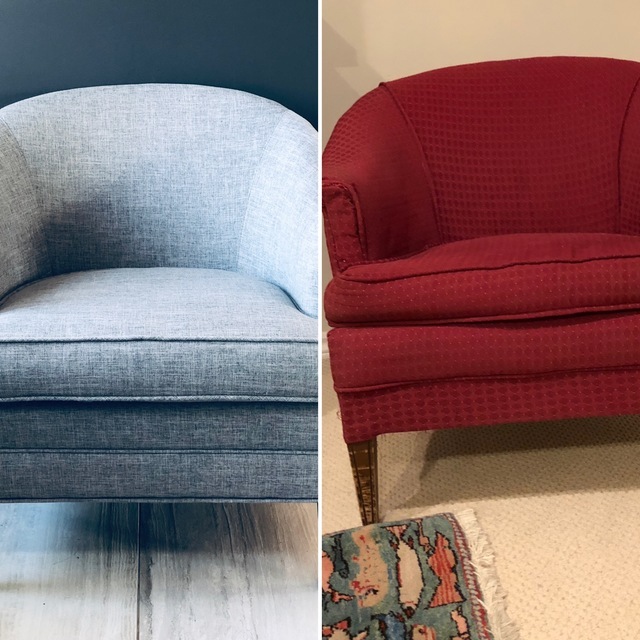 I hired Fine Design Interiors to upholster two small chrome-like chairs that are over 50 years old. These chairs were kept in storage for over 40 years and now required a face-lift. I had Mark clean and reupholster them, only to look brand new as if they were bought today. The material is just beautiful and the overall job exceeded my expectations. It is truly an amazing and outstanding professional job. 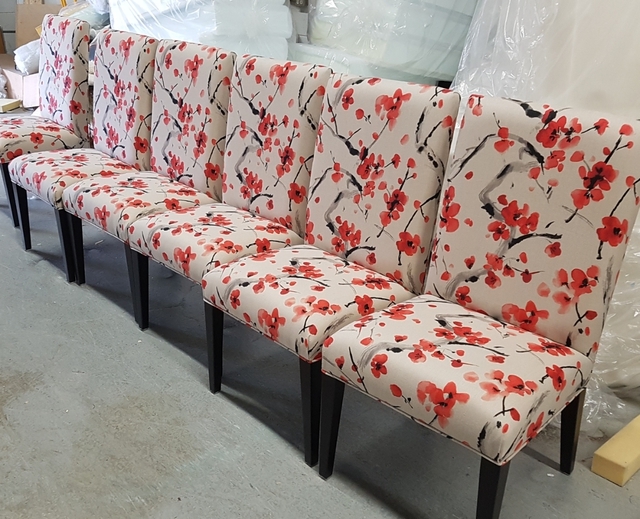 I would not hesitate to recommend Fine Design for any upholstering needs. One satisfied customer! 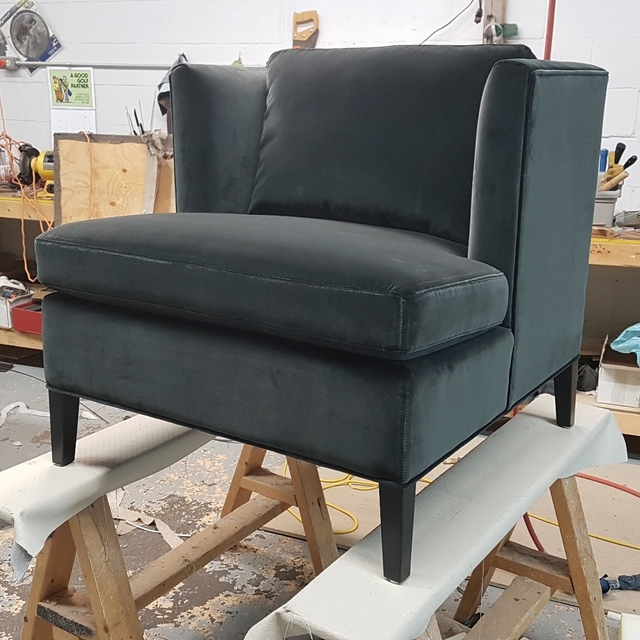 Hi Catheryne, it was a pleasure restoring your chairs and meeting you, if you need any custom furniture please give me a call. 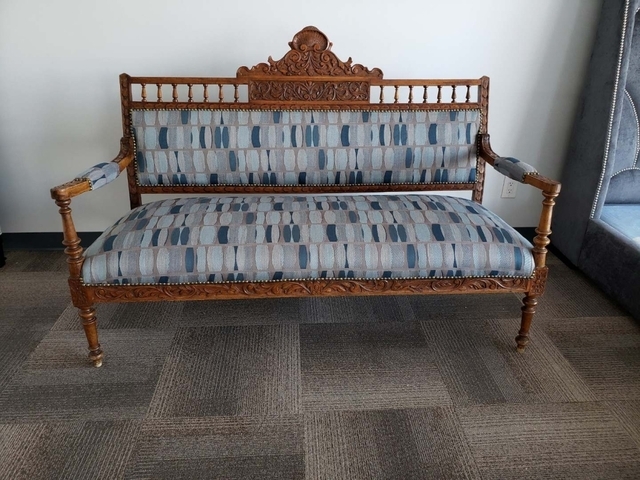 Antique Victorian couch needed mew springs and upholstery. Mark came to my home, brought sampleas and after choosing fabric, sifa was picked on the same day. Delivered 2 weeks early. Work was outstanding and do not stop getting compliments. Could not have been better in any way- both product and people. 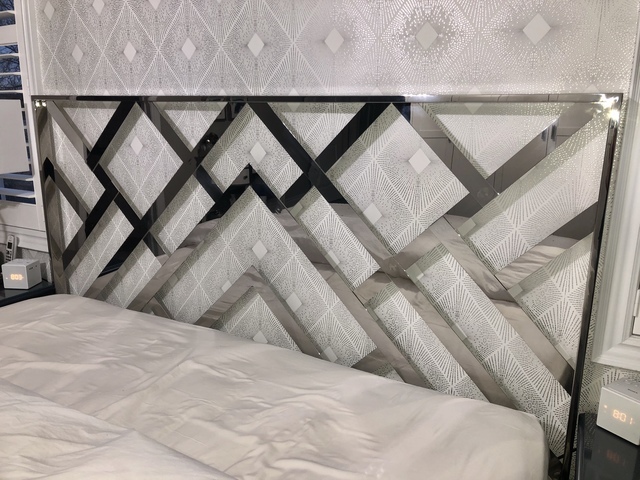 Working with Mark and his team we were able to get the exact look that we wanted for our bedroom headboard. Mark was always available throughout the whole process and communicated with us on the progress every step of the way. Thank you! It was a pleasure working with you, and the metal headboard came out beautiful. If you need more furniture please give me a call. We love our 'new' chair! Mark was a delight to work with. We have a number of pieces (some antiques) that need to be recovered. He gave us fair quotes and honest advice about what was worth reupholstering and not. We had a deadline for getting this chair done (daughter's engagement party) which he cheerfully accomodated. See photo on their Instagram. https://www.instagram.com/p/BuXKQLBAGh5Z7APrDYIfrFf5yqGBb6Q98btNaM0/ We look forward to him working his magic on our other pieces. 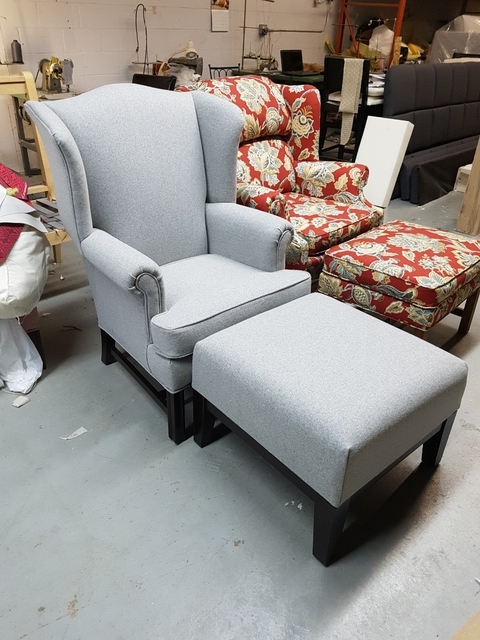 Hi Lynda , it was a pleasure dealing with you and letting me reupholster your antique chair. If you have any questions regarding furniture or need my service please give me a call. 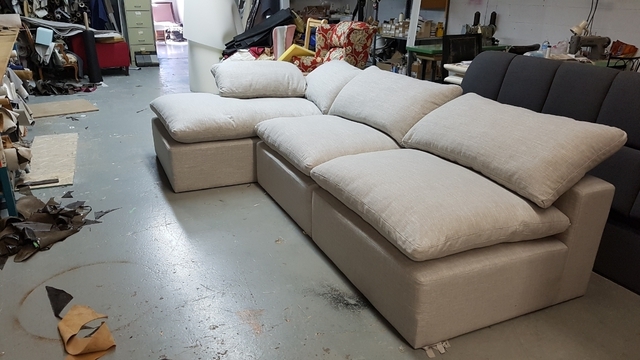 Fine Design Interiors reupholstered my 3 sofa cushions. Mark was very helpful in answering my questions and gave great advice. I will recommend this firm anytime. Hi Barb, thank you for the work and if you need any more furniture repair or new furniture please give us a call. It was a pleasure dealing with you. PLEASURE WORKING WITH MARK FROM FINE DESIGN. GREAT SERVICE AND QUALITY WORKMANSHIP. THE NEW UPHOLSTERING ON MY DINING CHAIRS WAS AMAZING. PICTURE SPEAKS FOR ITSELF. WILL USE AGAIN FOR FURHER PROJECTS AND HIGHLY RECOMMEND. Hi Jill how are you, it was a pleasure meeting you from Homestars and letting me reupholster your dining room chairs. If you have any questions or concerns regarding furniture in the future please give me a call. Long overdue and in desperate need of a facelift Mark and Enzo did an amazing restoration of my Nana’s club chairs. They are true masters of their trade with incredible customer service, high expectations of their work and reasonably priced. Our family was shocked by the transformation and quality of workmanship!! See you again soon! Mark and his team are a perfect combination of professional expertise and personal service. Reupholstery was beautifully done, and Mark was available for questions and concerns. I would definitely recommend Fine Design to anyone. I will use them again. Thanks again!!!! 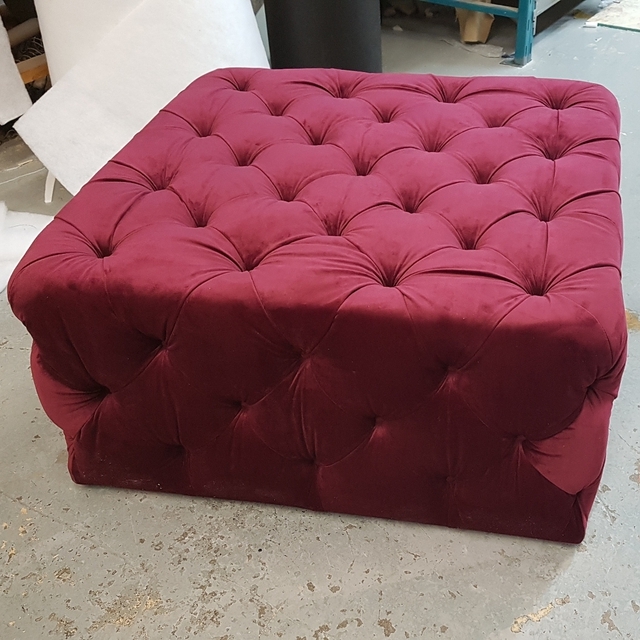 Mark and Enzo of Fine Design Interiors are two of the most highly skilled craftsmen in the upholstery trade today. 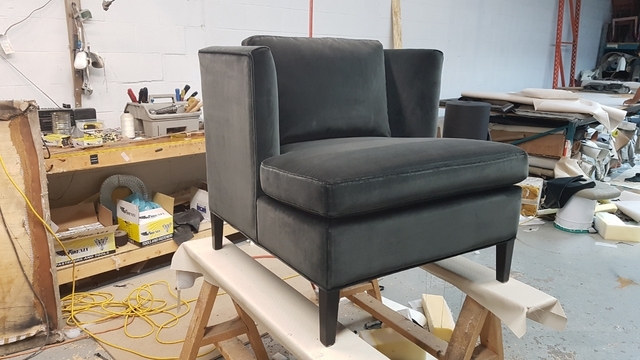 If you need finely detailed upholstery or reupholstery work done, you need look no further. I recently had a set of 8 antique dining chairs reupholstered and I am very pleased at how the worked turned out. Fine Design Interiors has thousands of sample fabrics to choose from, all at fair and reasonable prices. Old school talent, knowledge and craftsmanship that is difficult to find these days. Tell 'em Howard sent you! 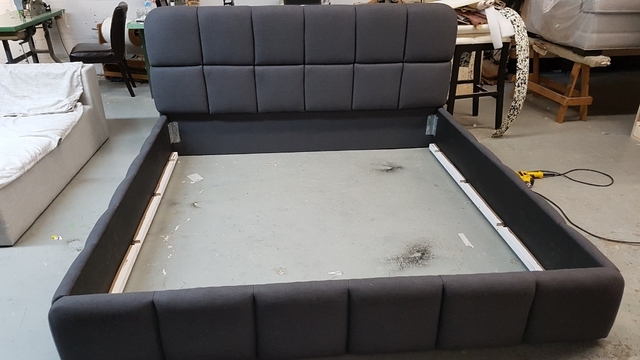 We have been working with Mark on various upholstering projects. Our latest was a tufted headboard and it turned out absolutely stunning. It was done to perfection and was ready right on time. The service is always professional and is highly recommended.